Rounding tool allows you to round up or down any values. Rounding numbers calculator is used to decrease the precision of a number to make it shorter, simpler and/or easier to grasp or to perform further operations on. It's often the case you don't need an exact number (such as 3324.238576) and would happily settle for 3324.34, 3324 or even 3300. 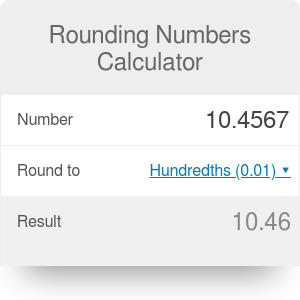 This rounding decimals calculator will let you do just that. Simply enter a number, pick precision from the list. Optionally, you may pick a rounding mode. In different situations you want your rounding algorithm to behave differently. Sometimes you want to round everything up (2.1 would be rounded to 3). Sometimes you want exact halves to be rounded up in half of the cases and down in the rest, to get a higher chance of an average staying close to the truth. Here's the description of all modes, we'll round to the nearest whole number. up - rounds away from zero. 3.2 and 3.6 become 4, but -3.2 and -3.6 become -4.
down - rounds towards zero. The above numbers become 3 and -3.
ceil - rounds towards infinity. It differs from rounding up in a way it handles negative numbers. Both -3.2 and -3.6 become -3.
floor - it rounds towards minus infinity. Similarly, negative numbers go the opposite way than in the case of rounding down. -3.2 becomes -4. It is used e.g. in our modulo calculator. half up (default) - rounds towards the nearest neighbor. If equidistant, it rounds away from zero (just like in the up mode). For example, 3.5 becomes 4 and -3.5 becomes -4. This is how rounding is usually performed. half down - similarly to half up, it rounds to the nearest neighbor, unless it's equidistant - then it rounds towards zero (just like in the down mode). The above numbers become respectively 3 and -3.
half even - an interesting one. Rounds towards the nearest neighbor, but if equidistant, it rounds towards an even number. Both 1.5 and 2.5 are rounded to 2. 3.5 and 4.5 are rounded to 4. It prevents cumulative rounding errors and this is why it's often used in science (we use it as a default mode in our sig fig calculator. If you'd round up all the time, the average is too high... this is why we round up half the time. The same rule (and for the same reason) is followed in accounting. When you want to round to the nearest cent, just use the half even mode. half ceil - the nearest neighbor, equidistant values go towards infinity. half floor - the nearest neighbor, equidistant towards minus infinity. Rounding Numbers Calculator can be embedded on your website to enrich the content you wrote and make it easier for your visitors to understand your message.